The 88 mm gun (eighty-eight) was a German anti-aircraft and anti-tank artillery gun from World War II. It was widely used by Germany throughout the war, and was one of the most recognized German weapons of the war. Development of the original models led to a wide variety of guns. The name applies to a series of guns, the first one officially called the 8.8 cm Flak 18, the improved 8.8 cm Flak 36, and later the 8.8 cm Flak 37. Flak is a contraction of German Flugzeugabwehrkanone meaning "aircraft-defensive cannon", the original purpose of the eighty-eight. In informal German use, the guns were universally known as the Acht-acht ("eight-eight"), a contraction of Acht-komma-acht Zentimeter ("8.8 cm"). In English, "flak" became a generic term for ground anti-aircraft fire. The versatile carriage allowed the eighty-eight to be fired in a limited anti-tank mode when still on wheels, and to be completely emplaced in only two-and-a-half minutes. Its successful use as an improvised anti-tank gun led to the development of a tank gun based upon it. These related guns served as the main armament of tanks such as the Tiger I: the 8.8 cm KwK 36, with the "KwK" abbreviation standing for KampfwagenKanone ("Battletank Cannon"). In addition to these Krupp's designs, Rheinmetall created later a more powerful anti-aircraft gun, the 8.8 cm Flak 41, produced in relatively small numbers. Krupp responded with another prototype of the long-barreled 88 mm gun, which was further developed into the anti-tank and tank destroyer 8.8 cm Pak 43 gun, and turret-mounted 8.8 cm KwK 43 heavy tank gun. Due to the problems of defending against attack by high-flying aircraft the Luftwaffe asked for newer weapons with even better performance as early as 1939. Rheinmetall responded with a new 88 mm L/71 design with a longer cartridge, the 8.8 cm Flak 41, with a prototype ready in 1941. It fired a 9.4-kilogram (20 lb) shell at a muzzle velocity of 1000 m/s (3,280 ft/s), giving it an effective ceiling of 11,300 meters (37,100 ft) and a maximum of 15,000 meters (49,000 ft), which General Otto Wilhelm von Renz said to be "almost equal to the 128-mm." It featured a lower silhouette on its turntable mounting than did the 8.8-cm Flak 18/36/37 on its pedestal mounting. Two types of gun barrel were used, with three or four sections. Improvements in reloading raised the firing rate, with 20 to 25 rounds a minute being quoted. Because of problems in service, the guns were almost exclusively used in Germany where they could be properly maintained and serviced. The Flak 41 had the disadvantage of complexity, and was prone to problems with ammunition, cases often jamming on extraction. 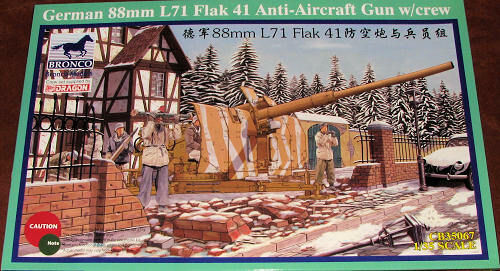 Because of the high cost and complexity of this Flak gun, the Germans manufactured relatively few of them, 556 in all. As of August 1944 only 157 were fielded, and 318 in January 1945. A final adaptation, known as the Flak 37/41, mounted the Flak 41 gun on the Flak 37 carriage, but only 13 were produced. The complexity of the real gun is only matched by the number of parts in this one by Bronco. 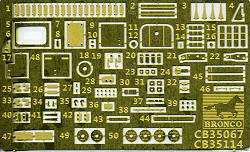 A dozen plastic sprues of various sizes are used along with an etched brass sheet to make this one. You will use up the first eight of forty construction steps building the basic platform for the gun. This is designed to allow the gun to rotate. It is here that you will need to decide if you want this posed in the transport or combat mode as you need to determine whether the grounding spikes are to be mounted on the chassis or not. The stabilization legs are designed to be moveable. You will also use a goodly number of the smaller bits from the well done photo etch sheet when building the table. Actually, I am wondering why they offer a transport position on this as there are no parts in the kit that would allow it to be posed as being towed. No wheels, you know. The rest of the build is on the gun itself and that is quite involved. This is very much a complex gun with a lot of small parts. 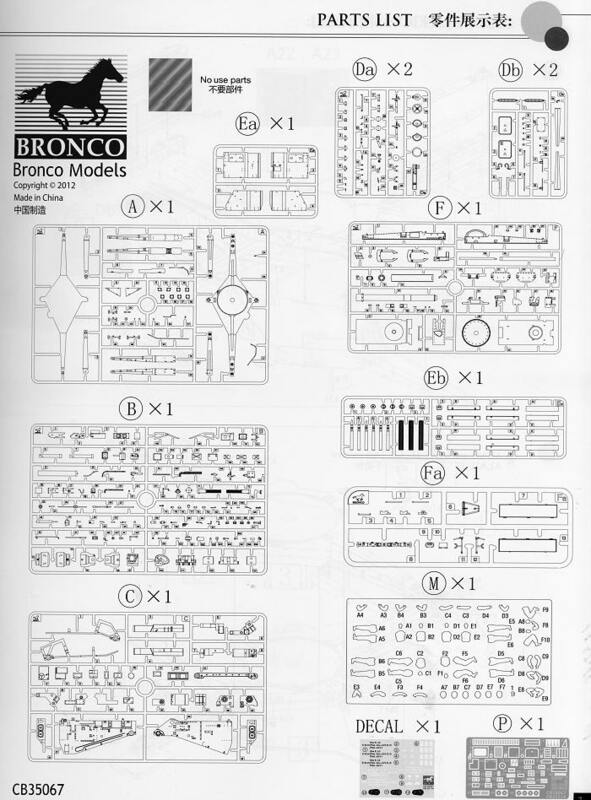 However, that is why folks buy kits like this one from Bronco, because they want the detail. They will not be disappointed. It appears that the gun can also be moved in elevation. Throughout the build, there are some steps that indicate whether you want it in the transport mode or not. The gun breech is very nicely detailed as well. The gun can be moved from the fire to the recoil position. A well molded gun shield allows the builder to have the aiming armor pieces open or closed. The kit comes with a full crew, courtesy of a Dragon figure set. A number of options for this crew are included such as a rangefinder and carrying case as well as a number of shells and their transport boxes. 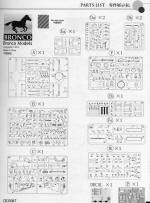 Instructions are superb with plenty of small detail illustrations, these being in color to help with placement of some possibly confusing parts. 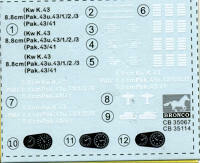 A nicely done decal sheet includes instrument faces, ammo box markings, and some 'kill markings' for one of the options. The markings options are basically differences in camouflage on the shield and barrel. The box art one has a yellow-green pattern. The other two patterns are dark green blotches and another has a scribble pattern in dark green. For those who are fans of artillery, this one is a kit you seriously need to add to your stash. The finished model will be a real beauty. Thanks to www.dragonmodelsusa.com for the preview kit. Get yours today at your local retailer or have them order it for you. If you would like your product reviewed fairly and fairly quickly, please contactme or see other details in the Note toContributors.